Be Safe Locks & Security - Alarms/Security, Locksmith based in Godalming, Surrey. Hello and Welcome to my Checkatrade Page. 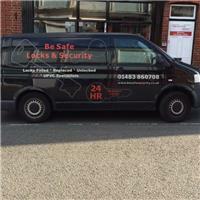 Be Safe Locks & Security Ltd has been trading since 1989 so we have over 25 years’ experience in the Locksmith trade. We have completed work for the Police and Local Councils. For all general enquiries our office hours are 9:00-5:00 Monday- Friday. Available for emergency call-outs between 8am - midnight, 7 days a week.